Eight Fun Ideas for Girls' Night Out! 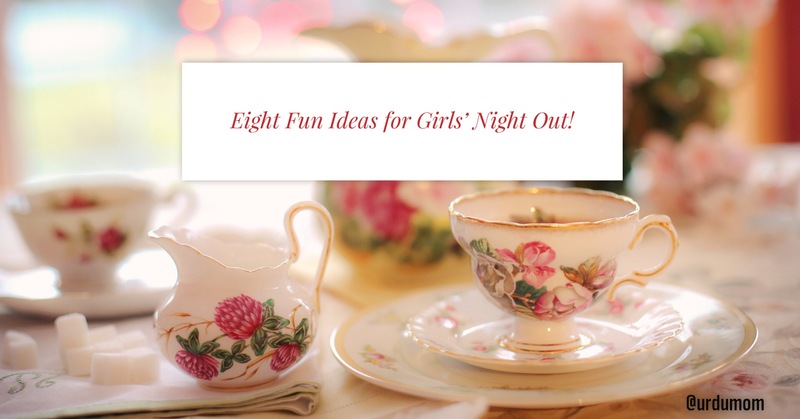 Eight Fun Ideas for Girls’ Night Out! Feeling jaded, tired and exhausted with the general responsibilities of life? A fun Girls’ Night Out is what you need! Here are some fun ideas to be “Simran” for a few hours and enjoy with your girl friends! No singing talent required! All you need is enthusiasm and the determination to have fun! Either hook up the machine at home or find a place in your city that has Karaoke Nights. There are also private Karaoke rooms that you can rent for the girls. Pick a movie and then choose a restaurant and a dress to go with the theme. Watching a Bollywood movie? Dress up in your desi finery. Going for a British period movie? Bring out the pearls. Get the girls together to enjoy a creative night of painting or crafting together. Many studios offer the service or you can ask an artist friend to lead the activity. Make sure to put on your aprons, pool all your painting supplies and have a great time. Pick a classy cafe, and ask the girls to get together for a Literary Night. Everyone brings a favourite line, poem or a short essay, to read out. Make sure the venue is not too loud so that you can hear each other. You can also pick a general theme such as Urdu literature, Rumi Night or Comedy/Satire. Enjoy a meal and then a night of Bowling fun. Make teams, show your competitive sides and have a great time. Dedicate a night with the girls to learn new tricks! Either raid your nearest Sephora or pool all your make-up supplies and get together at a friend’s house. Get one friend who is great at make-up to teach everyone else new tricks or follow some YouTube videos together. Put one some music and have a great time! Be sure to mark all your tools with a touch of nail polish to distinguish them to avoid mix ups. How about getting together to learn a new cuisine? My friends and I did a sushi-learning class a few weeks ago and we had a great time learning a new skill and sharing many laughs. If all else fails, a Spa Night is bound to be a hit with the girls. Get your manicures/pedicures and enjoy being pampered together. Most spas will also serve food and drinks alongside, making it a complete fun-packed evening. Line up babysitting for the children or make sure dad is home that evening to be on full duty. Make bookings and reservations at least a couple of weeks before, so that the evening goes smoothly. When you switch from your purse to a smaller clutch for the evening keep all essentials such as: driving license, credit card, cash, keys and the all important hair catch. I like to carry a lip shimmer in my clutch and love the all-natural Naturalene Lip Shimmer by Greeniche. Check out their website for all details about this amazing product made of all certified organic ingredients and available in lots of flavours! Hope you enjoyed all these tips and ideas about planning a Girls’ Night Out! Would love to hear what’s your favourite way of enjoying time with your friends. Disclaimer: This blog post is sponsored by Greeniche. All opinions and ideas are my own.